Learning, training and knowledge sharing and that's for a good cause. That gives satisfaction! Master class during the course, ham cutting. In november if Cati Gómez on many fronts propagating her box. So she did as an expert a masterclasses, together with 7 professionals from the absolute top of Spain. Best particular that Spanish Cortadora established in Netherlands in the row with Spain's and the best Cortadores Cortadoras. 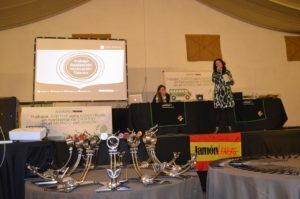 This charity course is organised by AGACUJ and by the Spanish Association ' no child without toys '. The proceeds will go to this organization that will make on Epiphany (6 January) children from poor families get a gift in Chiclana.